RS232 serial interface is still one of the most used wired communication standards. Introduced in 1960, it has survived and still surviving onslaught from many advanced standards because of its reliability and simplicity. They are intended to operate over a distance up to 15 meters and the maximum data rate is around 160 Kbits per second. They are often being used in many applications such as data acquisition systems, PLCs etc. While the underlying logical layer can be handled by UART interface, there are many possible application layer protocols that can be run on it. One of the most popular industrial protocol standards is called Modbus. Modbus is a serial communication protocol developed for transmitting information over serial lines between electronic devices. The Modbus network can have one Master device and up to 247 slave devices. The master device can request or write the information to the slave and the slave device will supply the information. Registers are allocated for each data in the slave device and the master will write or read data to and from a slave device’s register. It is an open protocol, where the manufacturer can build into their equipment without any royalties. The protocol has multiple versions such as Modbus RTU, Modbus ASCII for serial communication and Modbus TCP for Ethernet. Modbus has become the standard communication protocol in industry and it is a commonly available means of connecting industrial electronic devices. Day by day, the communication interfaces and protocols are being updated to handle large data more reliably and over a longer distance. Of late, due to the advent of Industry 4.0 and IIoT, the need for wireless communication becomes inevitable. Industry 4.0 brings smartness in automation and data exchange in manufacturing technologies. It includes IoT, cloud computing, etc which calls for seamless data communication. Existing infrastructure can enable them with minimal changes using wireless technologies. This necessitates a suitable gateway for converting the wired serial interfaces to wireless. Embien, following the current industry trends has launched a wireless module “eStorm-B1” under its eStorm series of solutions. The BLE module can support wireless serial communication with the available UART interface and can readily be used as a BLE to UART converter bridge. 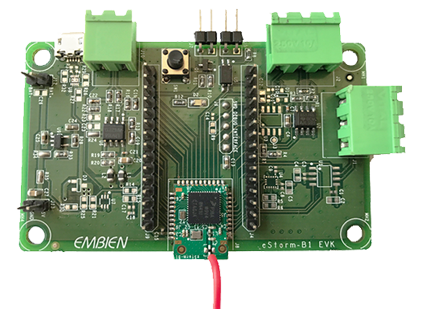 In addition to the COTS BLE module, Embien has also launched an evaluation kit “eStorm-B1 EVK”. This evaluation kit can support quick evaluation of eStorm-B1 module features. Of various interfaces, one that interests us for this blog is the presence of a RS232 interface. eStorm-B1 EVK based BLE to RS232 Modbus converter is suited for wireless Modbus gateway applications discussed earlier. eStorm-B1 EVK supports three wire RS232 serial communication via null modem cable and is exposed via a screw type PCB Terminal connector. Designed for rugged industrial environments, the EVK can operate in 5V DC input and RS232 receiver can accept up to +/- 30V input withstanding surges up to 15-kV (HBM) in the RS232 lines. Optional enclosure is also available. Configuration of baud rate, Stop and data bits. Thus eStorm-B1 as a wireless Modbus gateway can be used to interface with multiple devices for applications such as wireless data acquisition via existing data acquisition device, controlling the machines via PLCs for various industrial automation application, etc. Embien Technologies is a leading provider of embedded design services for the industrial automation. We have done various types of Data acquisition Systems, Industrial Human Machine interfaces, BLE based pH Meters, precision measuring instruments etc. We are currently working on enabling the industry 4.0 initiatives to make them smarter and greener.